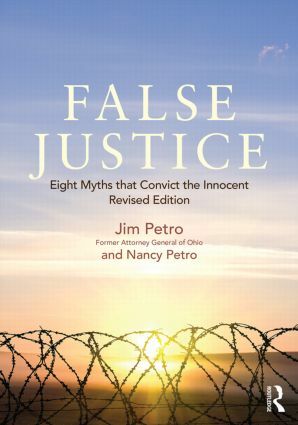 Compelling and engagingly written, this book by former Attorney General of Ohio Jim Petro and his wife, writer Nancy Petro, takes the reader inside actual cases, summarizes extensive research on the causes and consequences of wrongful conviction, and exposes eight common myths that inspire false confidence in the justice system and undermine reform. Now newly published in paperback with an extensive list of web links to wrongful conviction sources internationally, False Justice is ideal for use in a wide array of criminal justice and criminology courses. Myth 1: Everyone in prison claims innocence. Myth 2: Our system almost never convicts an innocent person. Myth 3: Only the guilty confess. Myth 4: Wrongful conviction is the result of innocent human error. Myth 5: An eyewitness is the best testimony. Myth 6: Conviction errors get corrected on appeal. Myth 7: It dishonors the victim to question a conviction. Myth 8: If the justice system has problems, the pros will fix them.